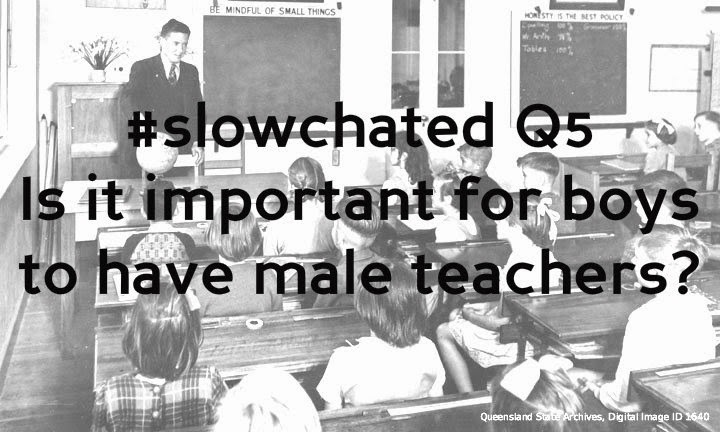 After a week of discussing boys and men in education, I have even more questions than I did when I started. 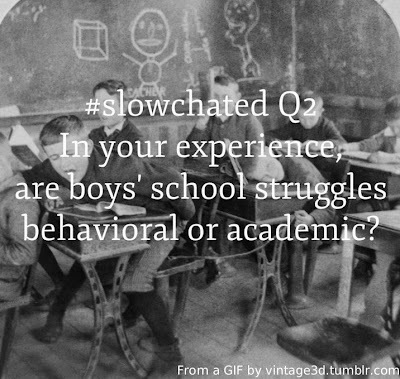 The biggest of those questions is how I should respond to the statistics that show boys struggling in schools. It's important to not generalize from the statistics: to continue to be responsive to the students in front of me, not the "average student" presented by the numbers. Still, the statistics concern me. 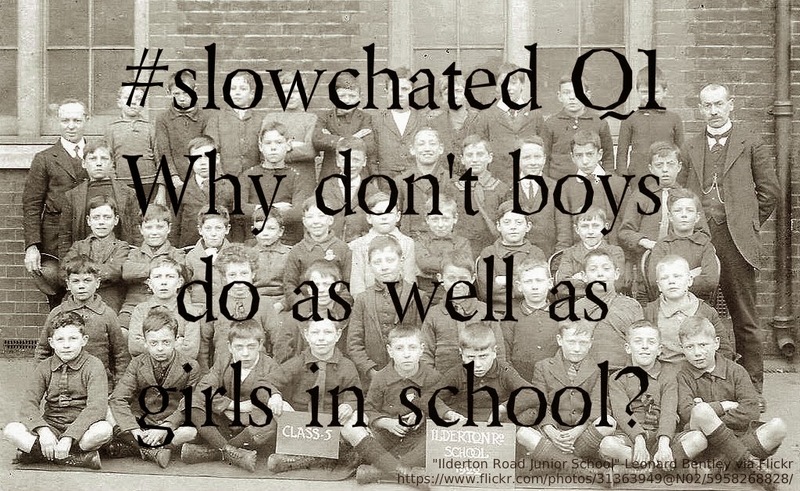 How can we make school better for boys and boys better for school? Here is a selection of tweets from the week to assist you in finding your answer to that question. I started the week with a cold opening. I hoped this question would elicit some emotion and strong opinion. 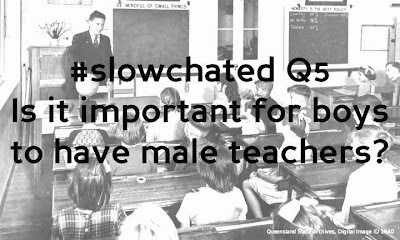 The answers ranged from uncertainty over whether this claim was true to collections of links about boys performance in school. Most responses, however, shared observations that may point to the problem. And my first question also brought back the first reminder that we must be careful with these statistics to avoid stereotyping our students. 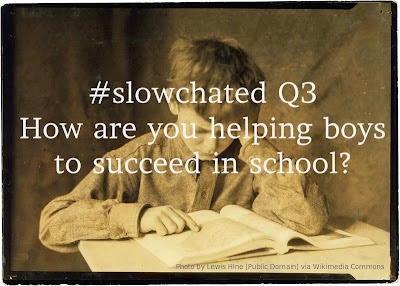 A2 #slowchated Both. Boy or girl, most behavioral issues, IMO, stem from academic and classroom struggles. All of those tweets began to point at the problem, but the next ones really summed it up for me. I've seen just as much inappropriate behavior from girls as boys, but boys are more likely to break a big school rule that results in harsh consequences like suspension. For example, bullying seems to happen equally with boys and girls, but boys' bullying is more likely to get physical and our school rules are clear that physical aggression results in suspension. Although the humiliation that can come with name-calling and rumors is just as damaging, if not more so, it is more difficult to determine when those behaviors warrant severe consequences. After spending two days discussing the problem, it was time to look for solutions. Interestingly, no one mentioned something specific they were doing for boys. All of these strategies would benefit all students. The key seems to be breaking away from the traditional teacher lectures/student listens model. Our fourth question went back to the big picture. Again, the suggestions were not specific to boys. 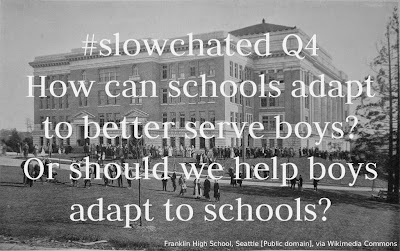 When schools better meet the needs of all learners, boys' performance and school experience will improve, too. 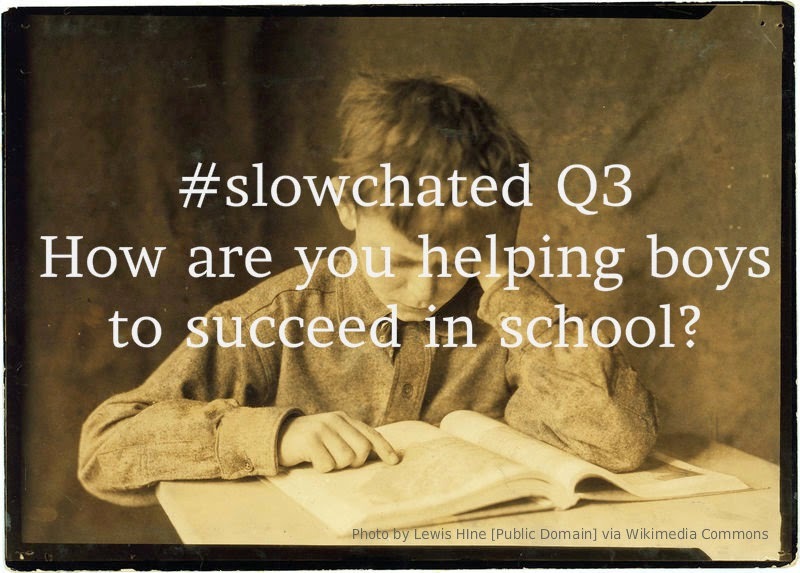 A4 #slowchated I think early childhood ed is key. Ss need time to learn through play - not high stakes kindergarten. I ended the week with a question I think about frequently as a male elementary school teacher. I've never worked (or attended) an elementary school with more than three male teachers. I've always felt that some boys get the idea that school and education is a female pursuit when they don't see men teaching classes. Being the Friday question, there weren't too many responses, but I think the one below says it all. Male role models are important, whether or not they're found in schools. Still, this is an idea I would like to explore more, so I might dedicate an entire chat to this topic in the future.